Christmas house tours are some of my favorite things to view during the holidays each year. 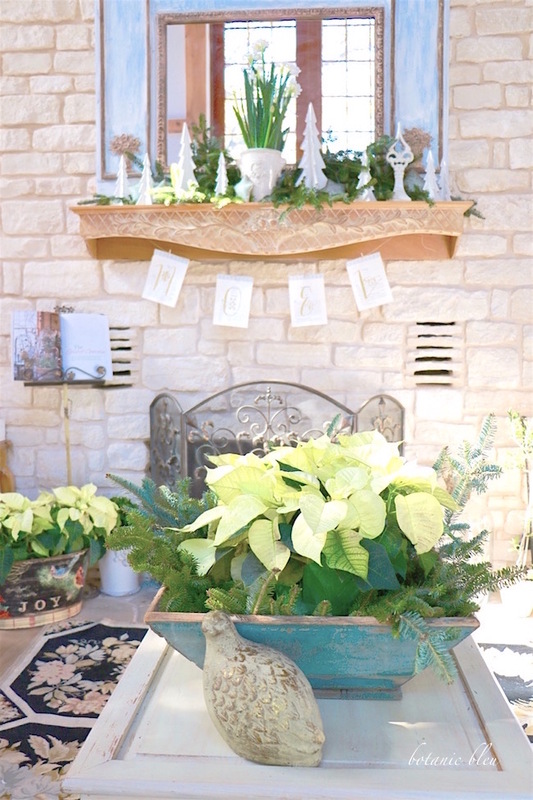 I love seeing how others dress their homes in special ways, and I often am inspired to incorporate some of the decorating tips into my own holiday arrangements. The holidays are a great time to find some new ideas. However, even though I love Christmas decorating inspired by house tours, I also stay true to my own personal style for Christmas decorations. I don't completely introduce a whole new look or style in my house. Most of us do not have the resources in money or time to completely renovate our houses for the holidays. 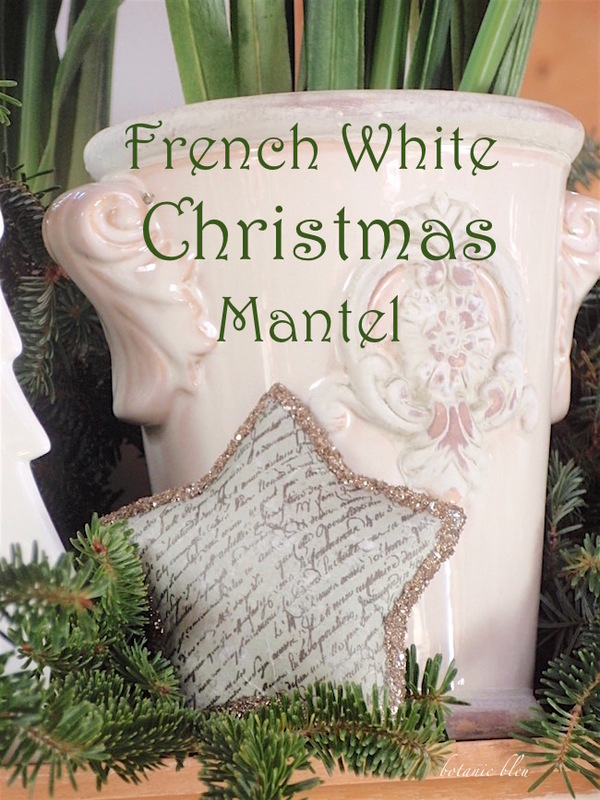 Here's how I incorporate Christmas decorations in my French-inspired garden and home, starting with a French white Christmas tree mantel. 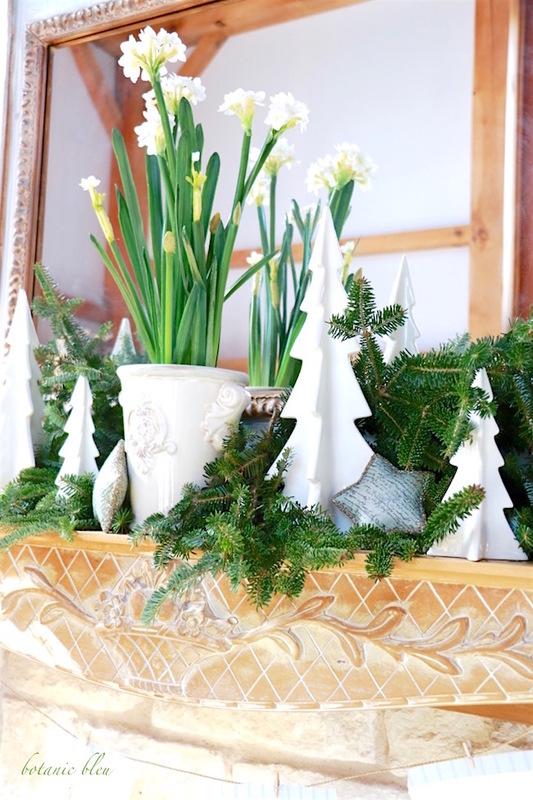 First, greenery is on the top of my list of new things to add to the mantel each Christmas. Some years it is preserved boxwood, but most years it is fresh greenery from our yard or cut from the bottom of our live Christmas tree. This year, Frasier fir clippings and faux narcissus are the basis for the living room mantel's natural greenery decorations. Last year I saw a beautiful Christmas tree with paperwhite flowers as part of its main decorations, and I began to think of ways to use paperwhites for this Christmas. 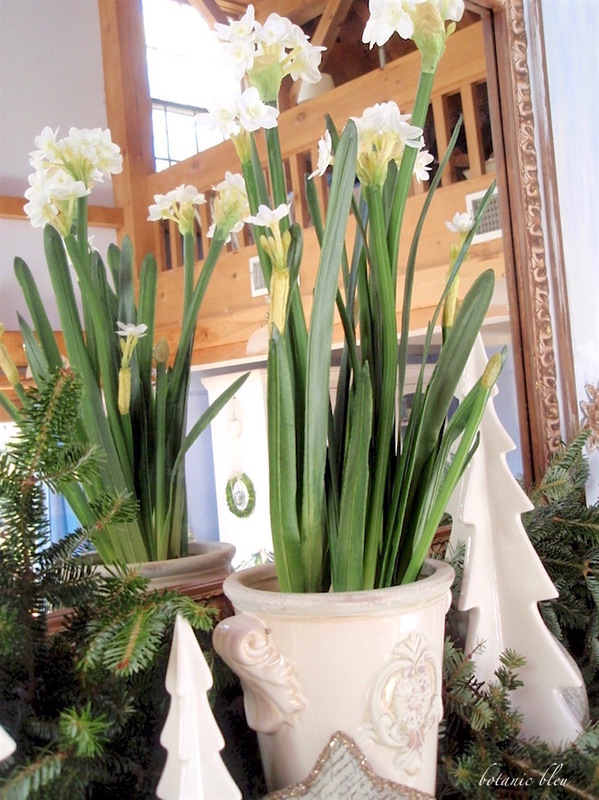 Paperwhites in a French-style ceramic white pot is the center of the French white Christmas tree mantel. 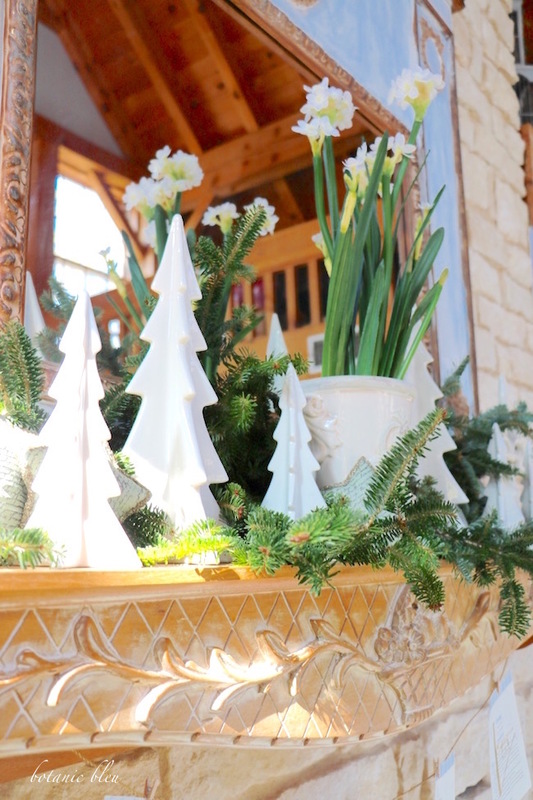 A collection of three sizes of white ceramic Christmas trees scattered across the mantel transition the arrangement from the tall paperwhites down to the shortest of the three ceramic trees. Varying heights of objects makes arrangements more interesting than uniform heights of objects. A second design feature that adds interest to arrangements is placing objects at varying depths on a surface. None of the white ceramic trees line up on the mantel. 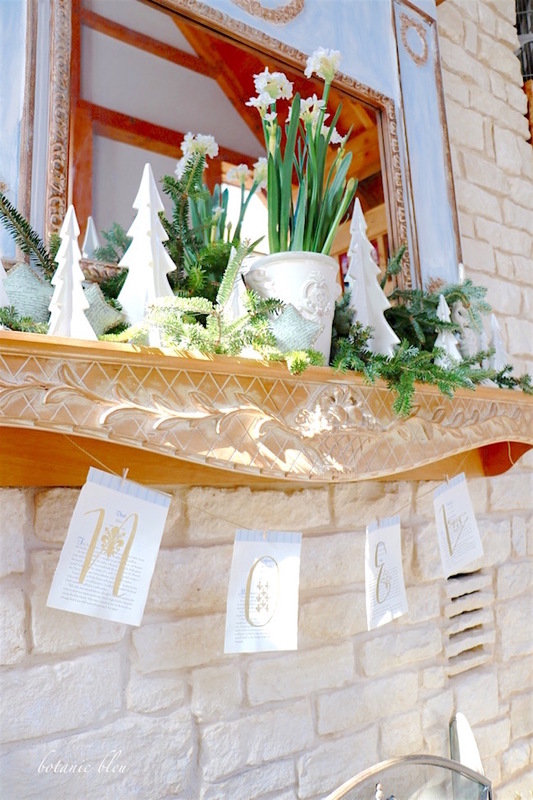 Green papier mâché script stars add another French accent to the mantel. Glittered edges of the stars give a little sparkle without overwhelming the fresh greenery and creamy white ceramic pot and trees. 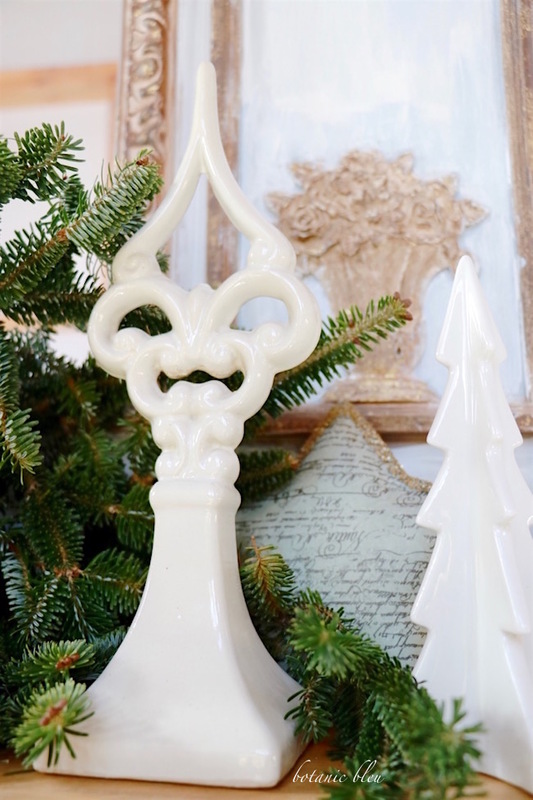 A third French-style item, a tall white ceramic fleur de lis, coordinates in color, texture, and height with the medium-height white ceramic tree on the other end of the mantel. The French-inspired ceramic pot, script green stars, and ceramic fleur de lis coordinate with the mirror's French style. White and green is a refreshing botanical look that makes me happy. 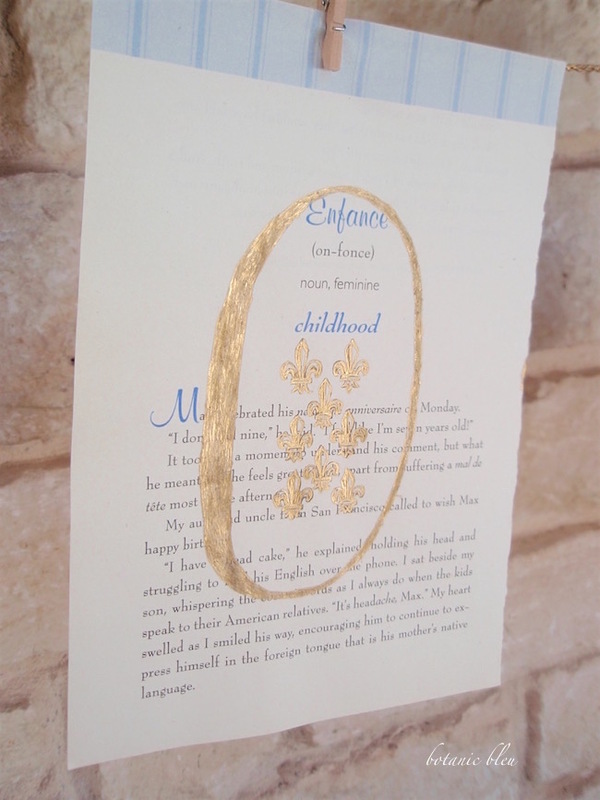 A handmade NOEL banner printed on book pages from Words In A French Life have a blue top border and a handful of words printed in blue that go with the blue mirror and walls. 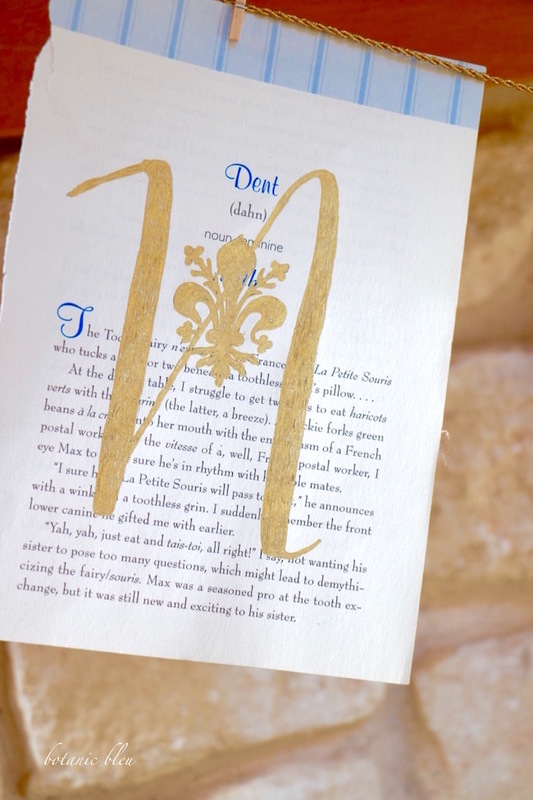 Letters printed on each page were hand painted using a gold paint pen. Each letter in the word NOEL has a different character from a special font called The French. Most of the characters in The French are fleur de lis designs. 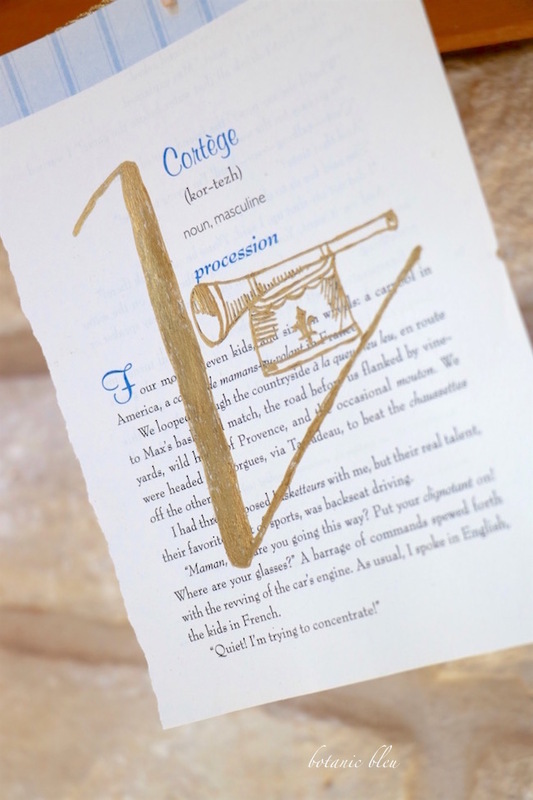 The font includes one special character that looks like a trumpet with a crested banner hanging from it. Pages from the same book were part of a White Christmas Holiday Table setting. 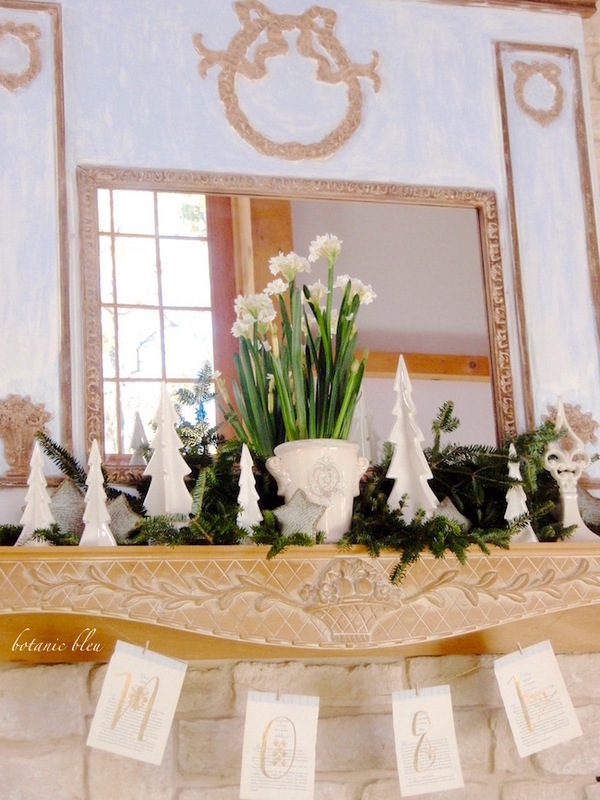 The French white Christmas tree mantel fits right in with my existing style and color scheme. Filled with Christmas cheer and French country joie de vivre. Check back later this week for a more detailed look at the rustic blue box holding white poinsettias and Frasier fir greenery. 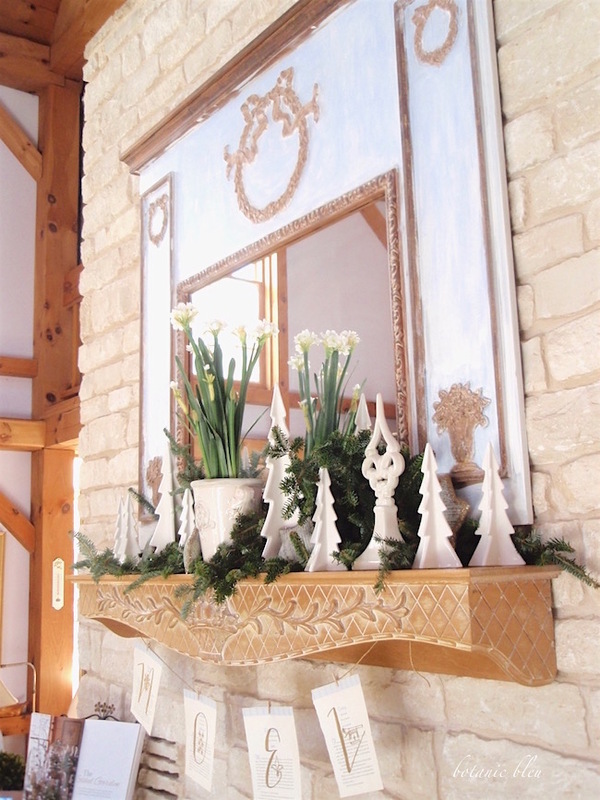 Is your mantel decorated for the season? Please share your Instagram, Facebook, Pinterest, and blog photo links at Monday Social. Tis the season for enjoying holiday decorations. Blessings to you and your family at this festive time of the year... a time when mantels are dressed in holiday styles of all kinds. 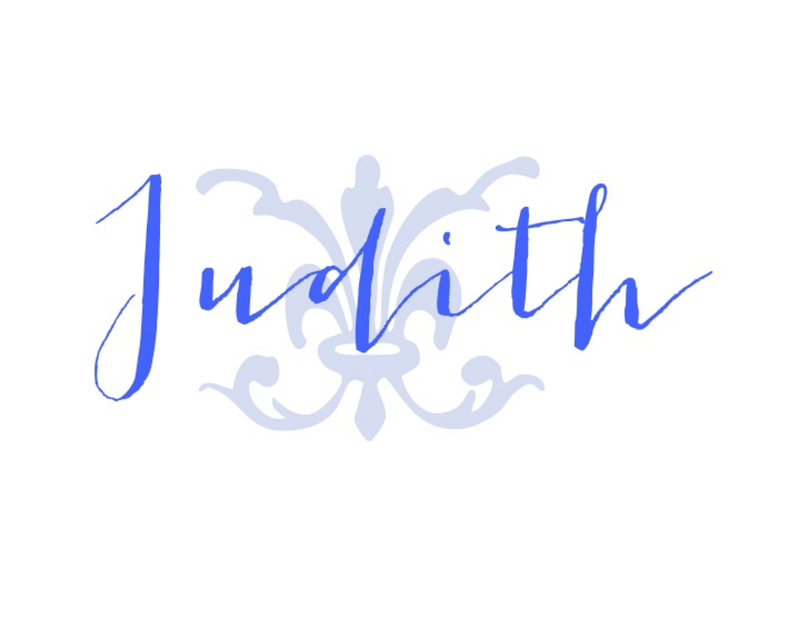 This is all so beautiful, Judith! So fresh and lovely! Thank you for featuring those beautiful pages - what a treasure! I hope you and your family are having a wonderful Christmas season! I just love how you decorated for Christmas, Judith! Your mantel is absolutely breathtaking, I don't think I have ever seen it before. The carving is exquisite. Your use of paperwhites is just perfect. Finally may I say that this is the very first time I have found the banner used in a tasteful way, hooray for you!! Thank you for all the inspiration. Thanks, Jan. When we moved into our house, there wasn’t a mantel yet, just the large posts sticking our of the fireplace where a mantel could be placed. I found this mantel in a home decor catalog, and it was being sold as a wall shelf. When it arrived, it was the perfect size and style I wanted for our mantel. The banner… this is the first ever banner I have made. I am so glad you like it. This is amazing - so pretty and full of inspiration. 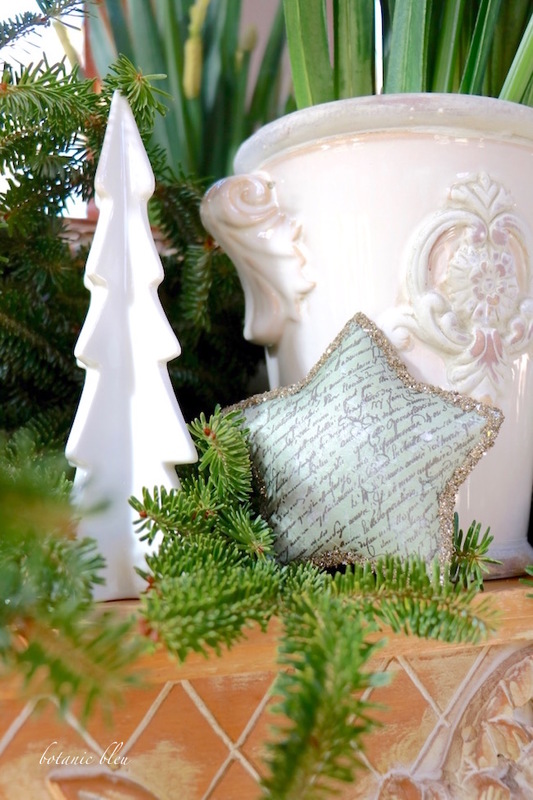 Love the stars with the glitter edges and Paper whites are a favorite here. Everything is displayed to perfection. LOVE! You just made my day. Thanks for visiting. Wishing you a Joyeux Noël. Your mantel is gorgeous, Judith. I have a similar French style pot. Now I need to grow some paper whites in it. First of all that mirror is just amazing! A perfect pairing with the wonderful paperwhites and naturals! Your mantle is beautiful. I especially like the book page banner. 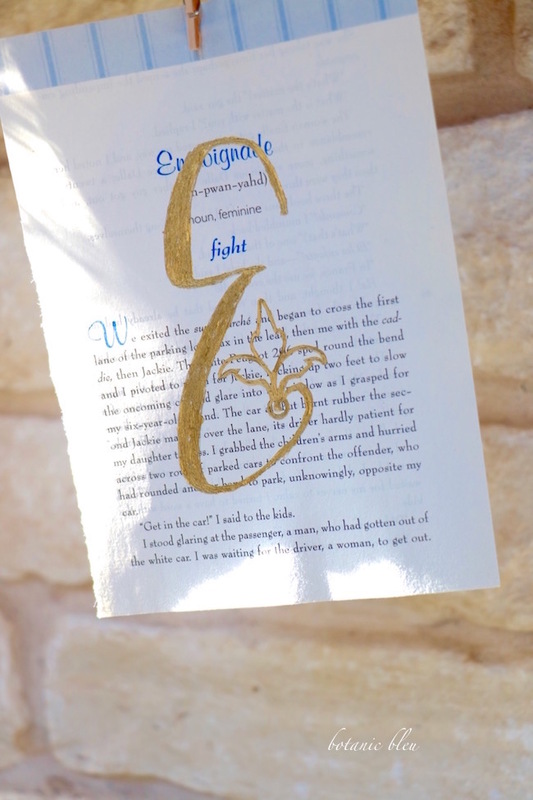 Book pages are a favorite decorating tool of mine. You are right, not many of us have the disposable income to reinvent our homes every year and personally our traditions would not be the same without our favorite ornaments. I am new to your blog and am so happy that I hopped over. I will be back. Merry Christmas! Welcome to Botanic Bleu. I am glad you hopped over, too.